A friend of mine asked if I was all exfoliated now. I’ve been sharing the scrubs I’ve been making lately on my Facebook profile with my friends and family. My answer was yes – my skin is very happy right now. 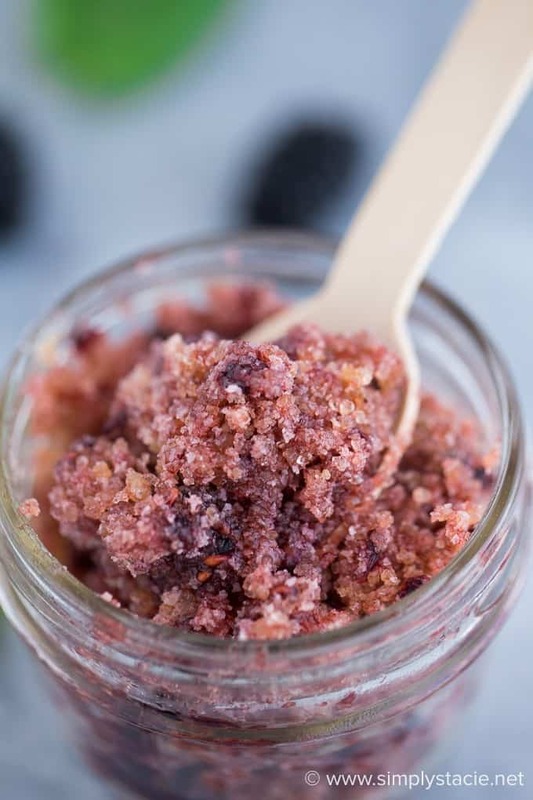 Plus, I’ve been having fun creating these DIY sugar scrubs and sharing them with everyone. 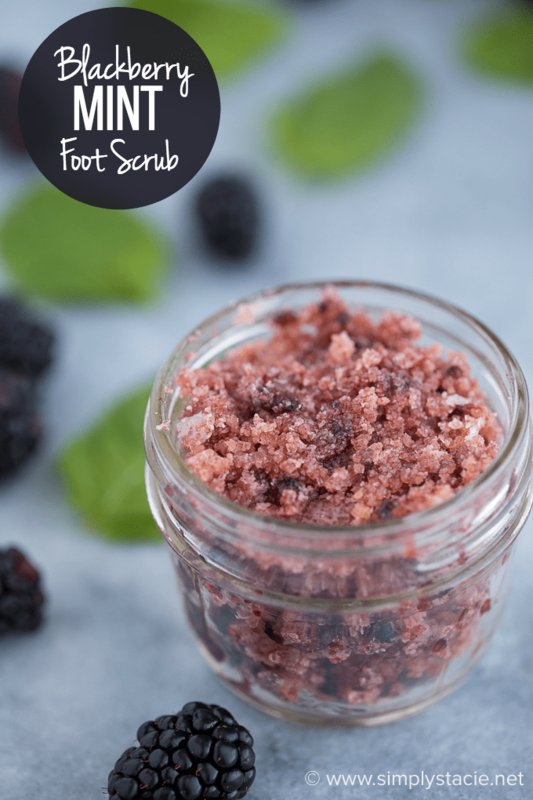 Today I have another one – a Blackberry Mint Foot Scrub. Sore, tired feet begone! 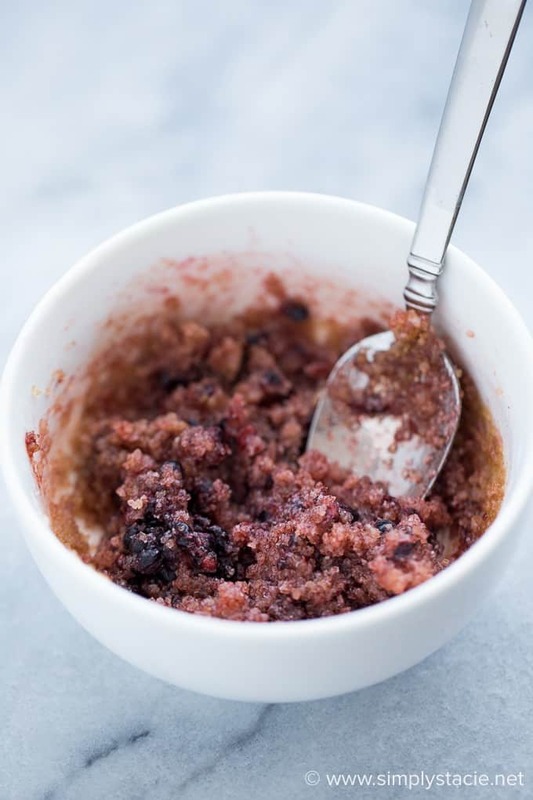 The inspiration for this scrub started with the blackberries in my fridge. My daughter calls them grape berries because they look like a bushel of grapes. Not only are they yummy and nutritious, they are also good for your skin. 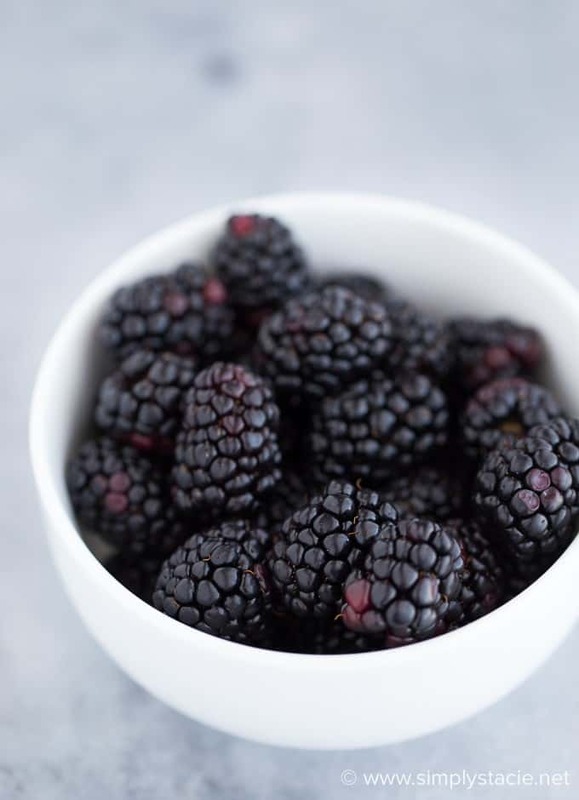 Blackberries contain Vitamin A, C and K and are powerful antioxidant. 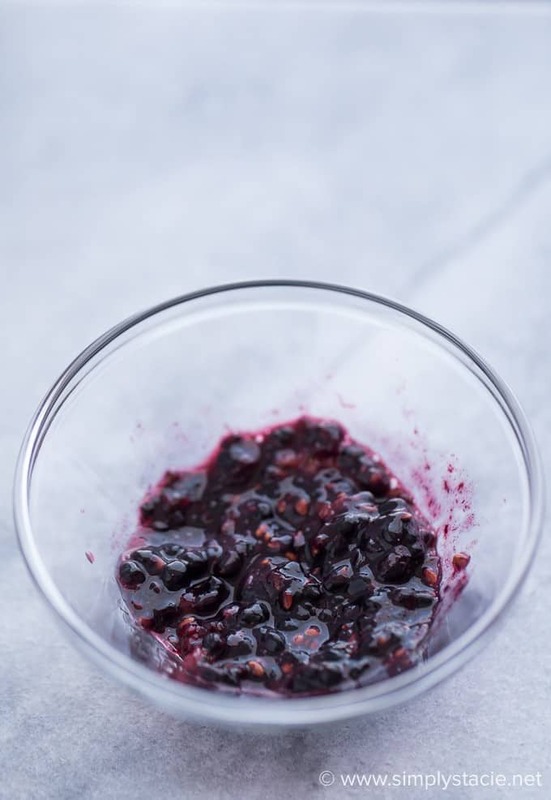 You’ll need four ingredients to make this foot scrub: fresh blackberries, coconut oil, raw sugar and peppermint essential oil. Mash up four blackberries with a fork. I wouldn’t bother using a food processor here. A fork gets the job done with little effort. 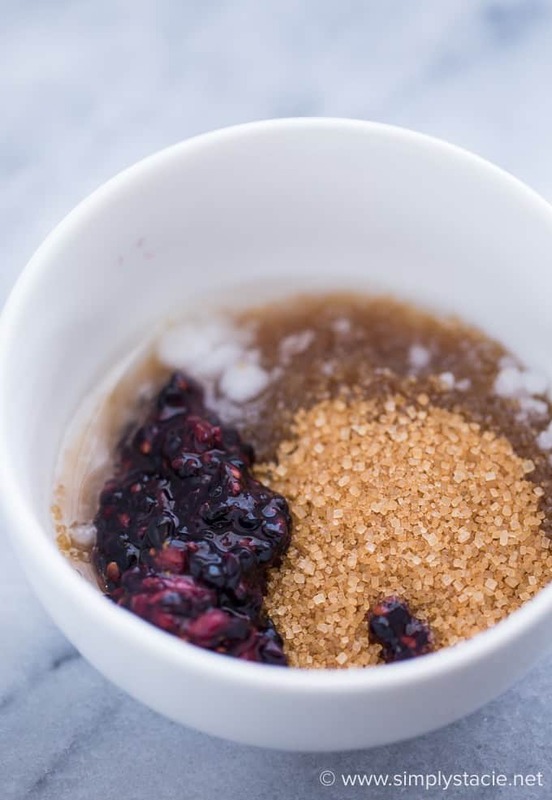 I’m loving raw sugar in scrubs! It holds itself up well to the wet ingredients and doesn’t completely dissolve. It gives a nice bit of grit you need in an exfoliating scrub. I had a jar of coconut oil in my pantry that I totally forgot about. I heated a couple tablespoonfuls in the microwave to liquify it. You can pick up a jar at most grocery stores or health food stores. My aunt eats this stuff on toast…. The coconut oil, not the scrub! Peppermint is invigorating and is wonderful to use on aching feet. I used this scrub after a long day of shopping and walking around a huge mall in Ottawa. My feet felt so much better! Plus, they were a lot softer too. They needed some TLC. Add all ingredients into a small bowl and stir to combine. Add in extra coconut oil and/or sugar to achieve desired consistency. Scoop into a small mason jar. To use, massage into wet feet and rinse thoroughly. Pat feet to dry. Store in a small mason jar in your fridge for up to a week. I use a few tablespoonfuls for each foot. It doesn’t last long so I wanted to make sure to use it up! Do your feet need a little TLC? Sounds interesting and worth trying. Never thought about using ingredients like this for a scrub but they are all natural so it has to be good for the skin. I need to do this foot rub because my feet have been covered up all winter and this would help rejuvenate them and make them feel so good. Thanks for the recipe for this scrub. Your scrub recipes are lots of fun. I see that you can keep this in the fridge for up to one week. I love the ingredients this is actually something i would enjoying trying,thanks for the recipe! This looks like an awesome foot scrub. I love all the ones I’ve seen. Thanks for sharing. Sounds lovely! Not hard to find ingredients either! Must try this! Thanks! I love making my own cosmetic products so I know exactly what’s in them. Thank you for sharing. Such a cool idea! It sounds like it owuld smell amazing! This looks wonderful! 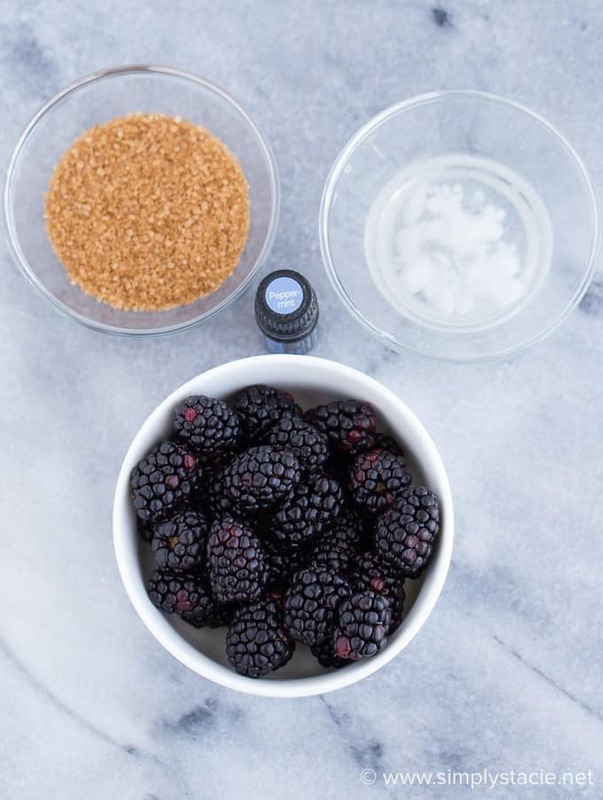 I love the combination of blackberries and peppermint – usually in a smoothie, but hey, I’ll take a foot scrub anytime! 🙂 Looking forward to trying this out. Thanks for sharing and happy to meet you through Creative Ways.